Flavoured beer is considered one of the fastest-growing sectors in the beer market globally. It saw a 7% volume growth globally in 2013 according to Euromonitor International. With 42% of global adult drinkers under 34 remarking that they consume flavoured beers on at least an occasional basis (Reportbuyer.com, November 2013). 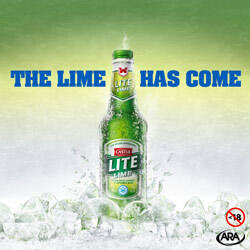 Castle Lite Lime will be available in 340ml NRB, 440ml can and 660ml RB nationwide from the 5 September 2014, and will be supported by an exciting Through-the-line campaign including a new TV ad.